Sweet little Keira was taken in with her siblings (Katie, Kylie, Kendra) & mom by a kind lady who saw that mom was giving birth on her porch. She kept the family safe & helped momma kitty care for Keira & her siblings until they were weaned, but she couldn't keep them past that point. We were able to take the babies into foster and they are thriving healthy little beans. 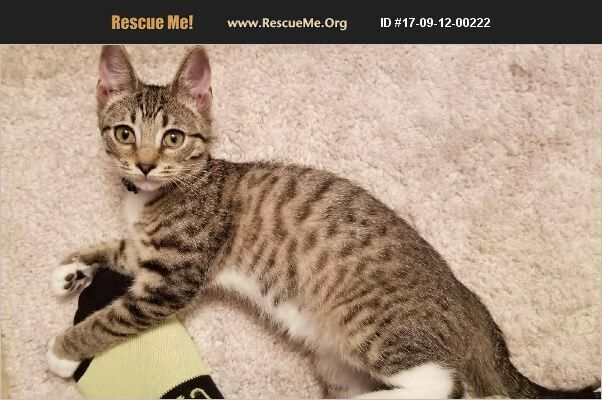 Keira is a beautiful brown tabby with a little bit of white & she loves to snuggle and sit in foster mom's lap. She is eating good, enjoys playing with her siblings and uses the litter box like a perfect little lady. Keira will be available soon, once she has been spayed which is planned for Sept. 28th. However, we are accepting applications now.